Welcome to Florida Bloggers Blog Hop, Week 4! Is this blog hop working for you? Would you prefer a different day? I am not getting more than 10 people at a time, and I would like to see what I can improve to get more people involved. Please comment below. And now, on to our featured blogger: Claudia Mundlos of Sanford 365! 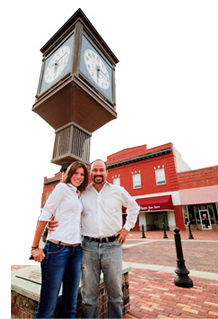 Claudia and her husband in Downtown Sanford. I started Sanford365.com in September 2008. My blog started more as a personal project: I wanted to take a 365 challenge of taking a picture a day to improve my photography skills and just appreciate my surroundings more. Your blog is about Sanford, Florida. What made you choose that topic? After determining the 365 challenge theme it kind of made sense to me to focus on the city I live in. In the beginning though I wasn’t necessarily only taking pictures in Sanford but just of something I did on that particular day. Once the challenge (i.e. the first year) was over I decided to keep the blog alive, possibly even continue to take a picture a day. But since that was at times rather exhausting I ended up not sticking to it. At this point I am blogging exclusively about events and things to do in Sanford. I am trying to show the world what life is like in Sanford FL. Is it hard to have fresh content for such a hyperlocal blog? Not at all! In fact, it makes it even a bit easier since I have a very specific topic. It’s also easy since my husband and I are out a lot in the area (not only for our job, we are both Realtors, but also to socialize). There is always a new business coming to town or an event I can write about. I also love to visit new restaurants in Sanford and make people aware of all the different ways they can get involved in the community. Blogging has in fact helped me to become more aware of my surroundings and the community I live in. I have come to really love the city I live in! Despite all the challenges, I believe in Sanford and in a great future for Sanford. People have also been very kind and supportive of my blog and especially my facebook page that keeps growing daily. I want to help our community to become even better and it is a really good feeling to know that you have a voice that can positively impact the community you live in! My blog is a pet blog. What are some great places or events in Sanford for dogs to visit? Sanford has a great dog park that was actually voted #2 out of the Top 10 Dog Parks in the US (Paw Park of Historic Sanford on 427 S. French Avenue). There is also the beautiful Riverwalk where you can walk your dog and have a very idyllic view of Lake Monroe. Sanford in general is also a very dog friendly town. Just take your furry friends out to any of the restaurants along First Street to sit outside on their street patios and they will be happy to serve you and provide your dog with water. So, it's now your turn. 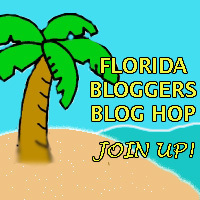 Join the Florida Bloggers Blog Hop and tell folks outside your blogging world what your blog is all about. Hmm, I know we talked about the different days on Twitter so you know my response. I will join up on whatever day you choose. Thanks for hosting the hop! Don't worry, it is sure to grow. Enjoyed the interview! I feel inspired. Thankyou! Happy Valentine day!